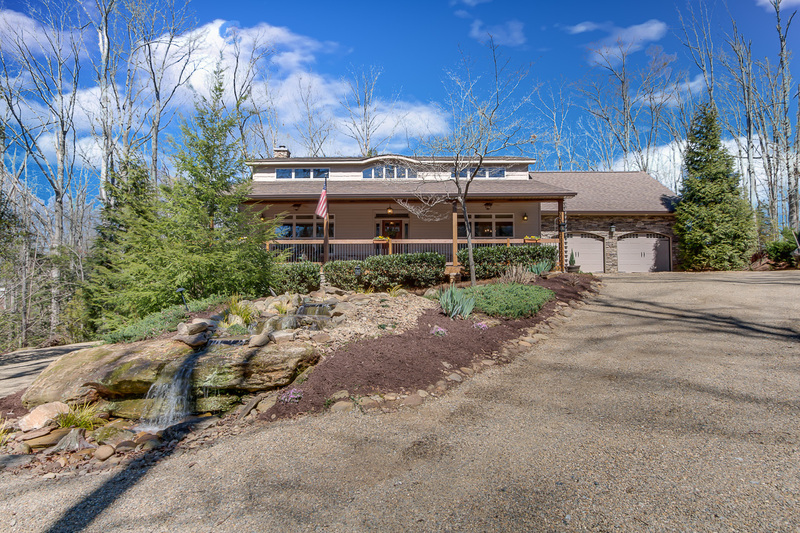 Phenomenal, one-of-a-kind, custom-built, perfectly located Contemporary-style home nestled up on a hill in 5 acres of woods with a creek in the meadow off Holland Road. 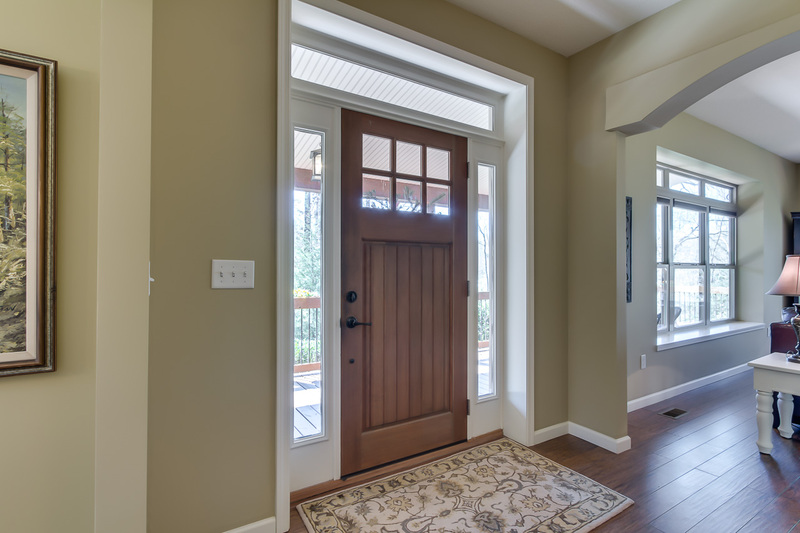 If you yearn for privacy and peace and quiet, but need to be in the city, you’ve found your home here. 4 bedroom/3 bath with 1883 sq ft basement and 3-car garage, this house is also built with the potential to finish 2 more bedrooms upstairs plus a bonus room above the garage (currently used as storage/attic). 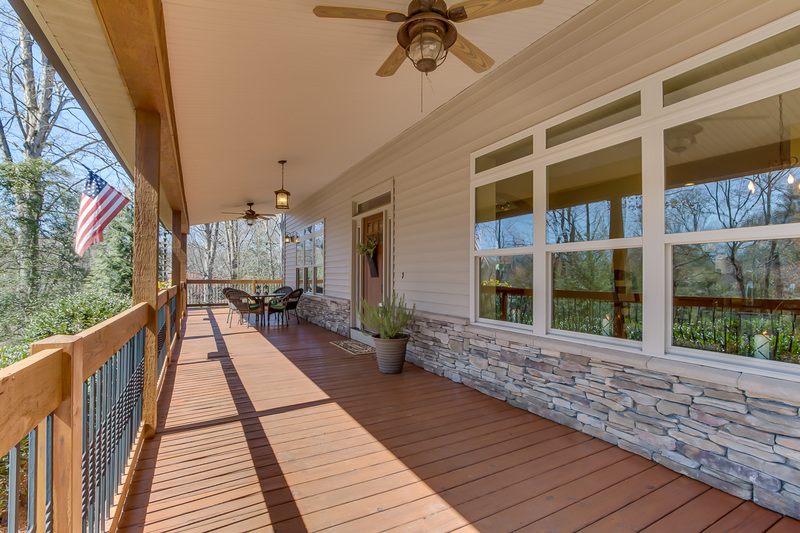 Exceptional features include: Two waterfalls, cedar/iron 75’ wrap-around porch porch, and transom arched skylights. The center-of-the-home gourmet kitchen has Corian, solid wood cabinetry, glass backsplash, a walk-through pass-through pantry and adjacent desk space, with a Breakfast Bar. The Master Bedroom has an en suite Bath with tile and stone galore, glass vessel sinks, pocket doors, and Walk-through closet adjacent to the Laundry Room. The Lower-Level Basement with stunning stained concrete flooring is a petite space perfect for in-laws, an AirBNB or Man Cave with 2 Bedrooms, (1 of the bedrooms possible large Rec Room with walk-out patio), Office Nook, Theater Space, Kitchen Area, Bathroom, Dining Spot with another Walk-Out Patio, and a 1-Car Garage. Here’s the best part of this home: the well-planned, meticulously-maintained yard, straight out of Better Homes and Gardens! With the partially fenced/partially wooded border,firepit with stone slab seating, out building, side entry gates, winding flagstone walls and paths weaved throughout the lawn and trickling fountains, there are plenty of places to wander, explore, play, and dream. All the windows were placed with care to take advantage of the forest views, so this home is filled with plenty of natural sunlight. Constructed from Insulated Concrete Forms (ICF), it is 10x stronger than wood framing and more energy efficient. You will love the sound of the gently rushing creek, the whisper of the wind through the woods, watching the wildlife and birds, and seeing the clear, star-filled sky at night. Come meet your new home! The things we love about Simpsonville are the many festivals throughout the year including Bacon Day!! We are really close to Heritage Park where many awesome bands come to play and the The Fair is held. It has that small town feel, yet you are only 15 minutes from downtown Greenville. What I love about our location is that while we are not in an official “neighborhood”, we have really great neighbors along our street and ones that we are backed up to. We are surrounded by really great people. This is what I will miss when we move! I love the quaint town of Simpsonville because it has great little places to eat like Exchange Company Coffee Bar & Bake Shop(for crepes and coffees) or Papas & Beer (Mexican). We can walk from Papas and Beer to the Ice Cream Station for really creative ice cream where you can meet your neighbors! There is also a German Pub (Unterhausen The Castle Cellar Pub) I have been dying to try too! I love the little shops that are right around the corner. I am close to everything…yet I am in my own little woods. From Wal-Mart to quaint little shops, Simpsonville has plenty! Moonstruck has fabulous little unique items for birthdays and for personalization! Oriental House delivers to us!!!! Wal-Mart Market is close as well as Publix, Ingles and our local Mauldin Open Air Market. When my husband first found the property, he said it was the most beautiful woods he had ever seen! When you drive up the driveway, you are immediately transported to your own mountain retreat. Leaving for work is difficult, but arriving home is like coming to your own Mountain retreat. The peace in the front and back of the house set the tranquil mood you only get when by a mountain stream. We see deer, turkey, rabbits and Blue Heron Crane often. The kids loved to catch little Sunfish in the creek that runs through the meadow. What I love about 400 Holland road is we are only 20 minutes from the strikingly beautiful Downtown Greenville! Huge waterfalls, first class and casual dining. Greenville has so many activities year round to indulge in: like food, wine, art, culture, theatre, music and entertainment. We enjoy the various parades and festivals held just minutes from our front door. The Simpsonville IMAX Movie Theater is just a few miles away, so when it is too hot or cold, we can be caught sharing a bucket of popcorn and indulging in the latest greatest flick! Every Saturday morning in the spring, summer and early fall, we can be found at the Simpsonville Saturday Farmers Market! I love our local farmers market. You can get some great deals on fresh produce! We fill our days with gardening and being entertained by our chickens in the meadow. We will often sit or picnic in the spring and early summer in the meadow and just chuckle while our chickens wonder what the heck we are doing sitting on their ground! Our favorite place the rest of the year, and when guests come, is our front porch. We eat breakfast, lunch and dinner every chance we get on the front porch. We love watching storms roll in and often can enjoy summer showers from the porch. Our utility costs are lower than our former 1400 square foot house. We have ICF construction that simply means our walls are more than 6-9 inches thick and insulate really well. The basement A/C doesn’t need to come on till July, and the heat is not needed till late November. The wood stove heats the 2200 sq ft main floor and keeps our winter electric bill just at $100!